Laser teeth whitening treatment from Dr Mark Dennes can quickly and safely brighten your smile, assisting in the removal of stains and discolouration. *The cost of the consultation ($80) is not charged if you then book and proceed with the Smartbleach® laser teeth whitening here at our Macquarie Street practice in Sydney. Our KTP Smartbleach® laser is safe, comfortable and produces unrivalled results. We believe it to be far superior to other whitening methods available. In fact, we have many patients come to us who have tried (and been disappointed with) other whitening treatments. The Smartbleach® laser whitening is able to provide the results patients were after without damaging their smile. Why choose Smartbleach® laser teeth whitening? Teeth whitening has become a very popular cosmetic choice for people all around the world, and like with most things in life ‘you get what you pay for’. Smartbleach laser tooth whitening takes just over one hour, and you will walk out of our office with a noticeably whiter, brighter smile. Your teeth will not be damaged by the Smartbleach process and, although looking whiter, will still look totally natural. How long with the results of Smartbleach® laser teeth whitening last? For most people, the results will last for 3-5 years, which is much longer than all other whitening treatments available today. Smartbleach laser whitening is safe, effective and long lasting. Smartbleach® laser teeth whitening should not be confused with other teeth whitening systems (such as ‘Zoom’, which uses ultraviolet light, not laser light). Many of the other teeth whitening systems can cause considerable tooth sensitivity (and potentially tooth or nerve damage) due to their method of action, and the Smartbleach® laser teeth whitening results achieved are known to last longer. If you are considering having the treatment, an initial consultation is normally needed to assess your suitability and show you the expected results. During this consultation we will also answer any questions that you may have regarding the treatment and the cause of your discolouration. Discolouration on the teeth can be caused by smoking, dietary habits, the effects of childhood antibiotics or, most commonly, time. As we get older our teeth tend to appear discoloured. Smartbleach® laser teeth whitening helps ‘wind back the clock’ on ageing and can help to renew your beautiful, vibrant smile. The treatment is effective because the interaction with the laser and the gel produces a whitening effect. Please be aware that you will need to be a little careful about some of the things you eat and drink for the first two days after the treatment. Red wine, black tea and cigarette smoking are the main things to avoid consuming during this period. This case is typical of the results we can achieve (although the patient is not ‘typical’ – it is my eldest daughter, for whom we performed the treatment prior to her wedding!) Her teeth were ‘average’ colour before the treatment. These photos were taken one hour apart – immediately before and after the Smartbleach treatment. Note that the strange ‘teeth’ projecting in from the sides are not teeth – they are ‘shade guides’ used to assess colour, and to give a reference point while taking photos. A dark shade and a light shade are used, and help show the significant change in tooth colour achieved by the Smartbleach treatment. We have treated many other brides-to-be, with similar excellent results. 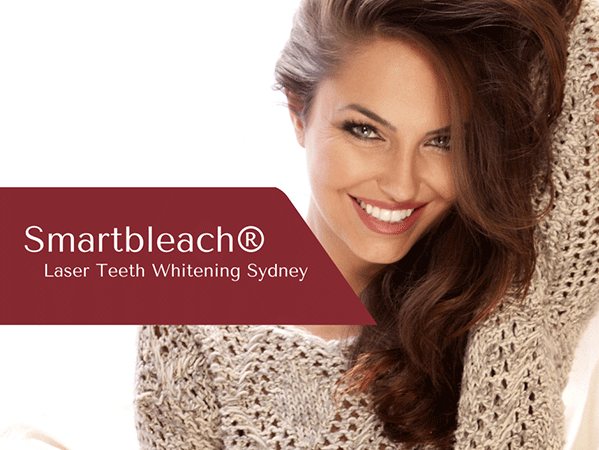 Achieve beautiful, long-lasting results with Smartbleach® laser teeth whitening. 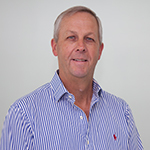 Dr Mark Dennes will take time to assess your smile, explain the treatment process and show the results the treatment can offer you. Once you are satisfied with the whole process, you are welcome to immediately arrange a laser teeth whitening treatment appointment – and rest assured that it will be Dr Mark Dennes (not a hygienist or other staff member) who will perform the Smartbleach® treatment for you.